A few weeks back I polled my instagram followers and asked what they wanted to see more of this holiday season, recipes or DIYs? 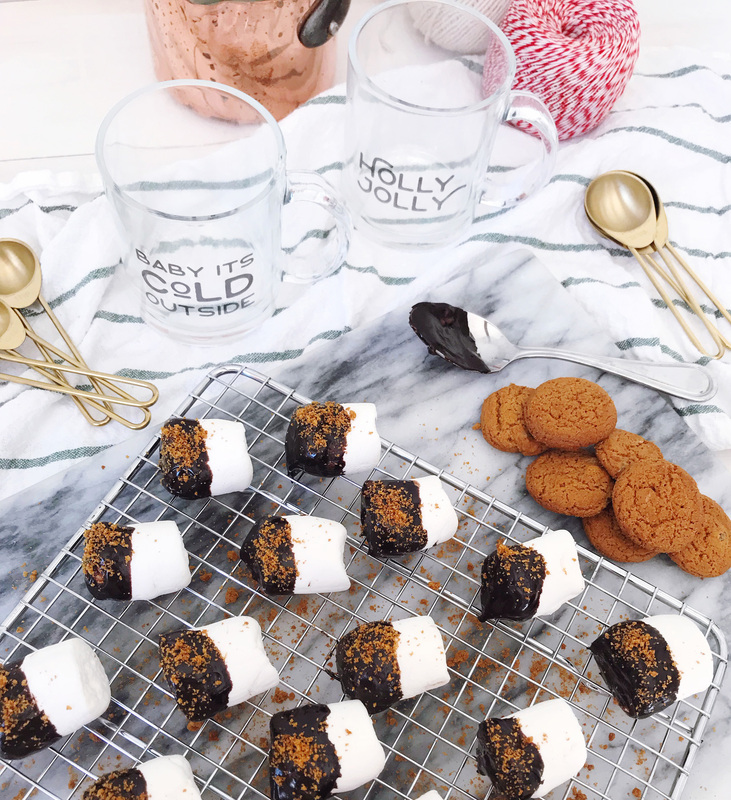 The response was almost 50/50 and I have great news, today’s blog post is an easy holiday recipe and makes a simple DIY gift too: Chocolate Ginger Snap Dipped Marshmallows! I have a wintertime rule that there must be hot cocoa and marshmallows in the cabinet in case of emergency. You just never know when the snow might start and you’ll need a cup of warm chocolaty goodness to help you get cozy. 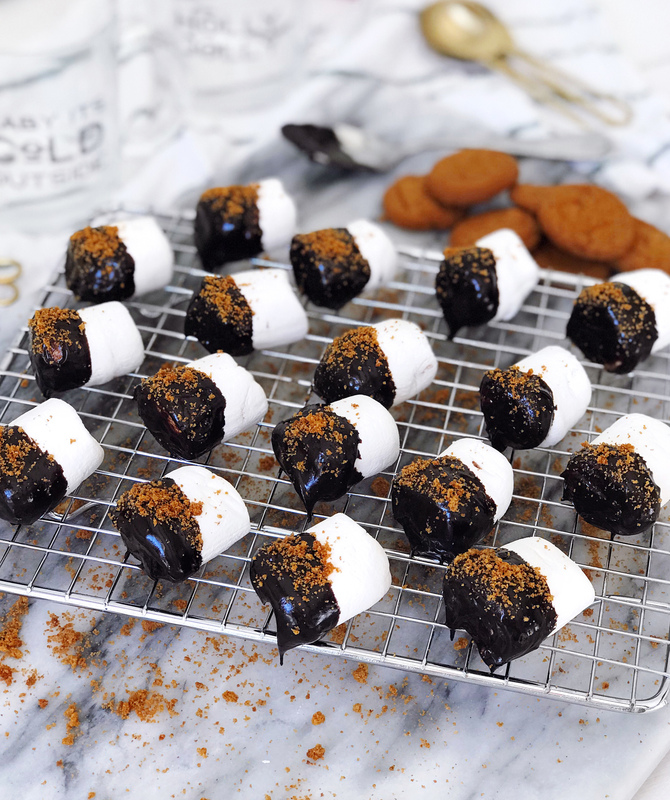 I thought it would be a fun idea to dress up marshmallows in dark chocolate and crumbled ginger snap cookies as a treat for me, and maybe wrap a few up as a hostess gift. To make these sweet and spiced treats, I combined about 1 cup of dark chocolate chips with 1 tbsp. of butter and heated them up in the microwave. Do this in 30-second increments, taking the chocolate out to stir in between each one until the chocolate is fully melted. Once the chocolate is all melted, I stirred in 2 tbsp. of heavy cream to loosen the mixture up. Dunk a big fluffy marshmallow in the chocolate sauce, about halfway, and rest it on a baking rack or piece of parchment paper to set up. Before the chocolate dries though, sprinkle some crushed ginger snap cookie crumbs on each one for a little spice and texture. 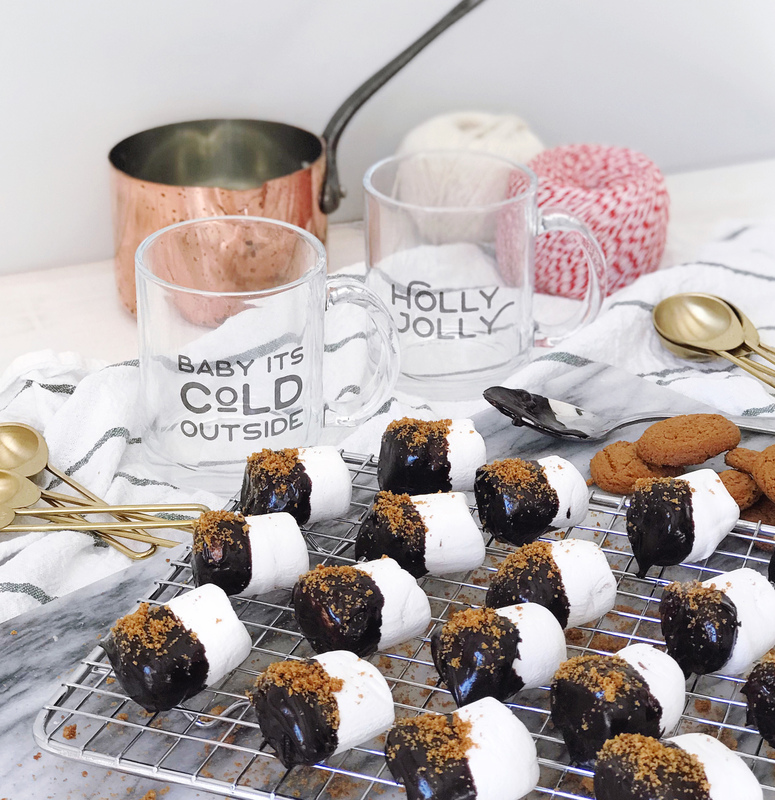 I served these marshmallows over a piping hot pour of cocoa, topped with whipped cream in the most darling holiday glass mugs from PaperFinch. How fun are the festive designs? I’m giving away a pair of these cute little mugs over on my Instagram page tonight – head there to enter to win some for yourself! Hostess Gifts, Wine, and DIY Wrapping Ideas. How to Fry a Thanksgiving Turkey. 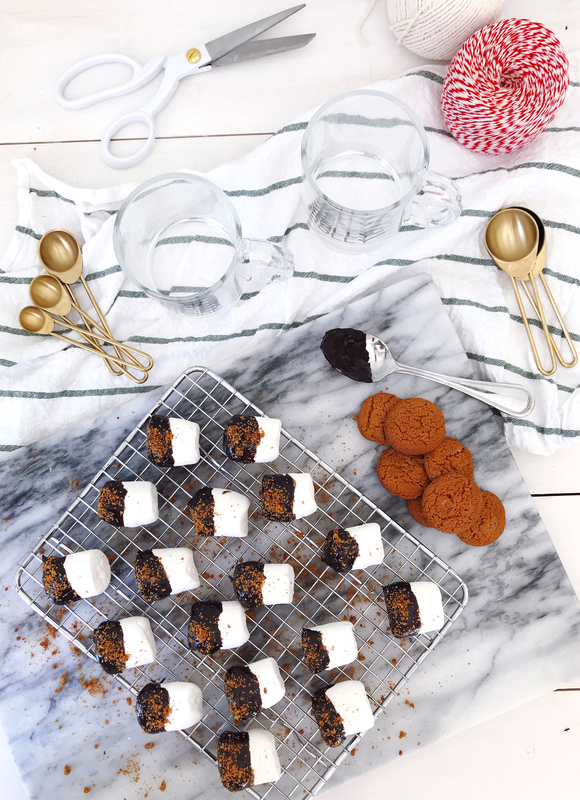 One Response to "Chocolate Ginger Snap Marshmallows (and a Giveaway!)" Kate, those marshmallows look and sound divine!!! 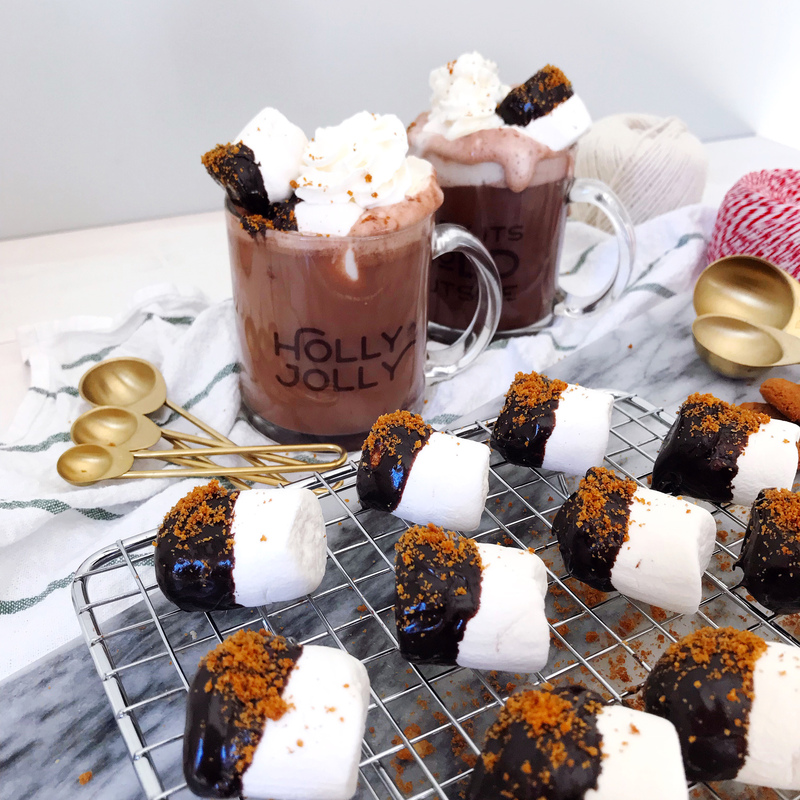 Perfect way to get cozy and chocolatey!